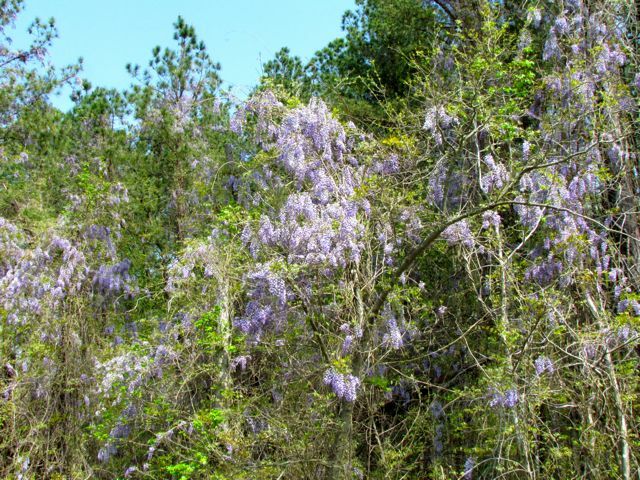 Chinese wisteria strangling a forest edge. If you’ve read this blog much, you’ve read about my feelings regarding invasive exotic species. These plants/animals/diseases are not native to the region, which means they have no natural predators. They move in, spread aggressively, and permanently alter the composition and health of our native forests. The problem is world-wide. Ecologists everywhere consider invasive species to be the second biggest threat to the remaining biodiversity on our planet. Only outright habitat destruction due to urbanization poses a greater threat to the health of our ecosystems. Of the alien plant invaders I hate the most on my five acres of North Carolina piedmont, I think the Most Evil prize must go to Japanese Stiltgrass (Microstegium vimineum). This invading grass has transformed creeks and wetlands throughout my region into big ugly messes, and the wildflowers and ferns that once flourished there are disappearing rapidly. 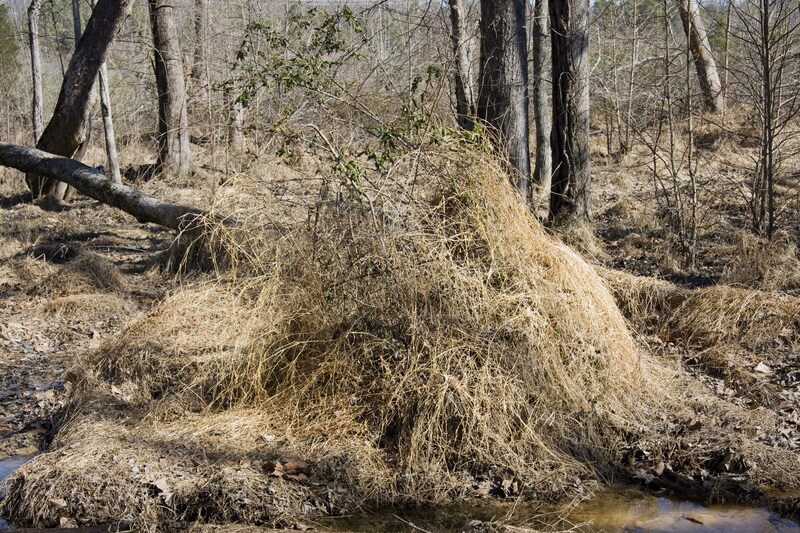 Winter-killed Microstegium vimineum still manages to overwhelm a native holly along the creek. 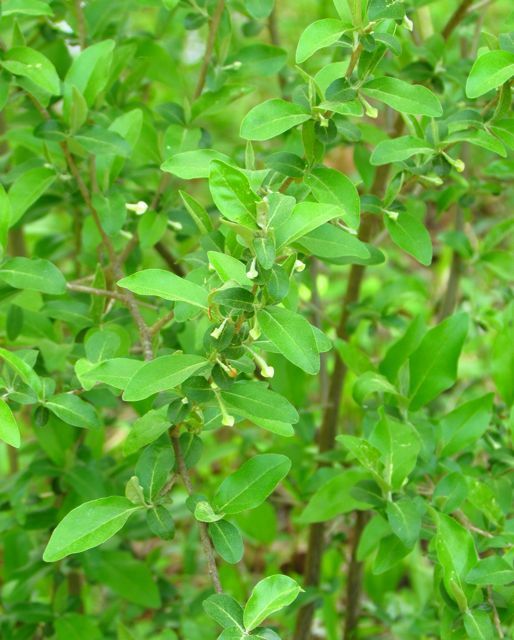 Number Two on my alien invader hate list is Japanese Honeysuckle (Lonicera japonica). Except during the coldest of winters, this evil vine remains green all year. Like Chinese Wisteria, Japanese Honeysuckle spreads from tree to tree in our forests, creating a dense tangle of vegetation that impairs the health of trees and provides access highways for predators of our native birds attempting to nest in the trees. 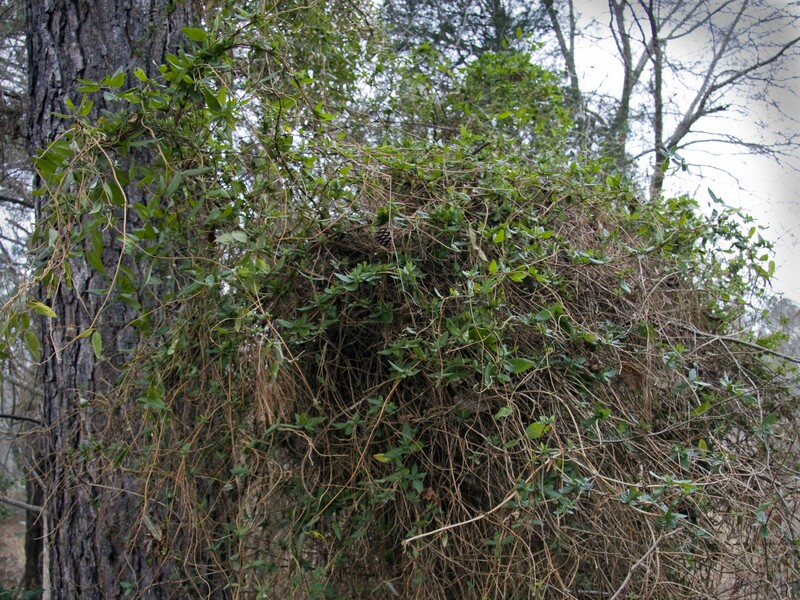 This tangle of Japanese Honeysuckle among the trees makes it easy for snakes, raccoons, and other predators to raid bird nests. 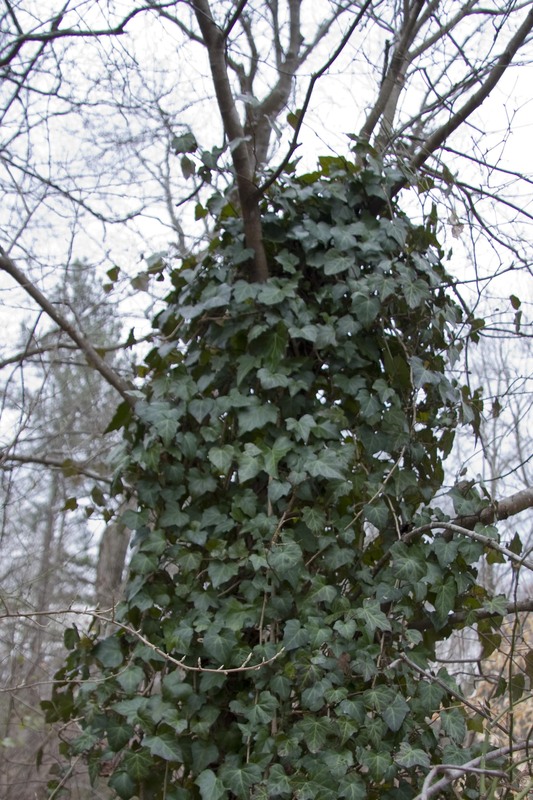 A lot of folks don’t realize that English Ivy is also invading our native forests. Like Japanese Honeysuckle, English Ivy produces berries beloved by birds. They spread the seeds through our forests, and the evergreen ivy starts its takeover. The weight of these non-native vines on our native trees causes them to be more easily pulled down by strong winds and ice storms. And from a purely aesthetic point of view, vines strangling forests are quite ugly. A native dogwood being devoured by invading English Ivy. My yard is also plagued by one of the invading species of Elaeagnus. More of a problem in piedmont uplands than floodplains, I’m finding it all over my yard now, thanks to bird-aided seed deposition. The flowers of Elaeagnus are suffocatingly sweet. Much scarier to me are invading evergreen privet shrubs on my floodplain. 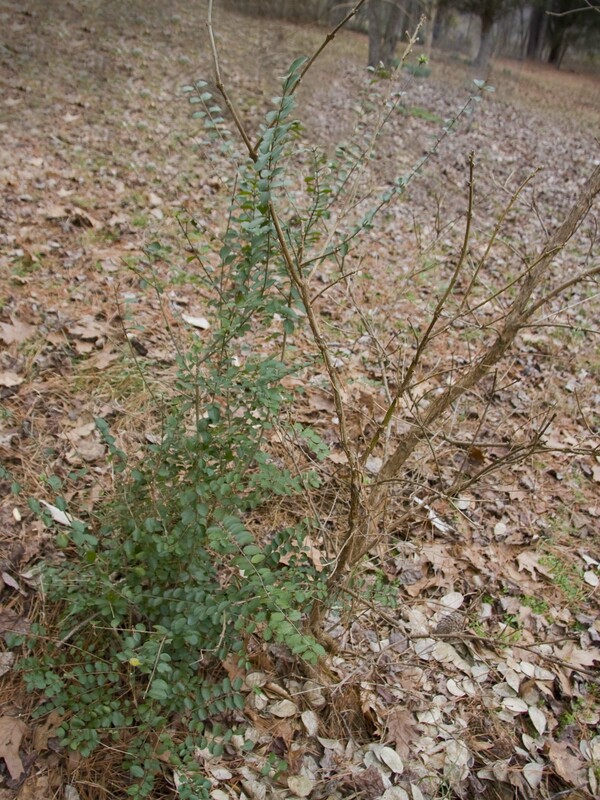 I see near-solid coverage of this shrub in wet woodlands throughout my region. They outcompete every native plant on the forest floor. I am always on the lookout for invading privet. They pop up everywhere thanks to the birds that love their fruits. The newest invader on my “I hate it!” list is Asiatic Hawksbeard (Youngia japonica). 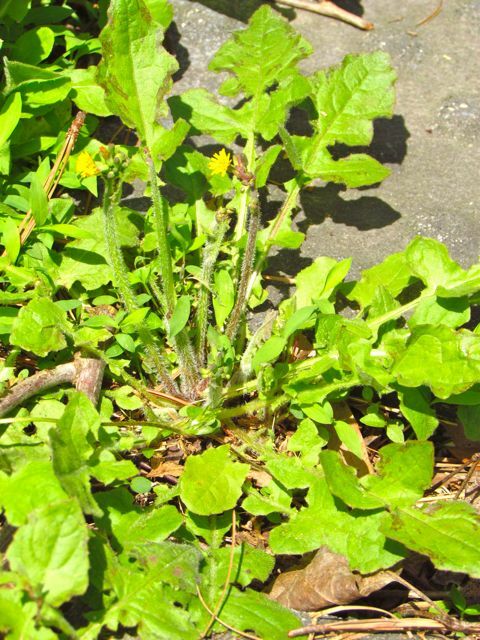 This astonishingly aggressive low-growing plant is outcompeting even the crabgrass in my lawn! Wonder Spouse is planning an attack with a propane-powered weeder that burns the aggressors into cinders. I don’t want to think about what happens if that plan doesn’t work. Under the “misery loves company” heading, I’m not alone in my battle against invading exotic species. Every government agency charged with protecting our native wild lands and animals is involved in this fight. Anyone caring for a park, farming, growing timber, or any other related activity is battling invasive species perpetually. A field trip on the second afternoon will feature the NC Zoo’s greenhouse and composting operations, as well as demonstrations of how they handle invasive species on their grounds. I’ve been to a number of these meetings, and I always learn much. For example, it was at one of these meetings that I learned about the Weed Wrench, still Wonder Spouse’s favorite weed eradication weapon. I’m planning to attend this year, and I’ll report the highlights here. If you live in another southeastern state, consider contacting and joining that state’s chapter of the Southeast Exotic Pest Plant Council. I checked the links to each state, and it looks like the Alabama, Florida, and North Carolina chapters are the most active, holding annual meetings. If you live in Georgia, Kentucky, Mississippi, or South Carolina, I would encourage you to contact those chapters through the above link and ask them why their site is inactive. I can promise you it is not because they aren’t fighting invasive alien species in those states too. If we stand any chance at all of preserving healthy native ecosystems in our parks, national forests, not to mention our own back yards, we all need to know as much as we can about invasive alien species. Forget about invaders from outer space. The invaders we need to worry about are already here. 2014 is the Year of the Lepidoptera! To end on a happier note, I thought I’d let my fellow North Carolinians know that our state park system has decided to highlight our native butterflies and moths this year. All of our NC parks will be offering walks and family-focused events throughout the year that will educate folks about these important insects. To find a list of events near you, go here. This entry was posted on January 24, 2014, 6:54 pm and is filed under Invasive Exotic Species, piedmont gardening. You can follow any responses to this entry through RSS 2.0. You can skip to the end and leave a response. Pinging is currently not allowed.